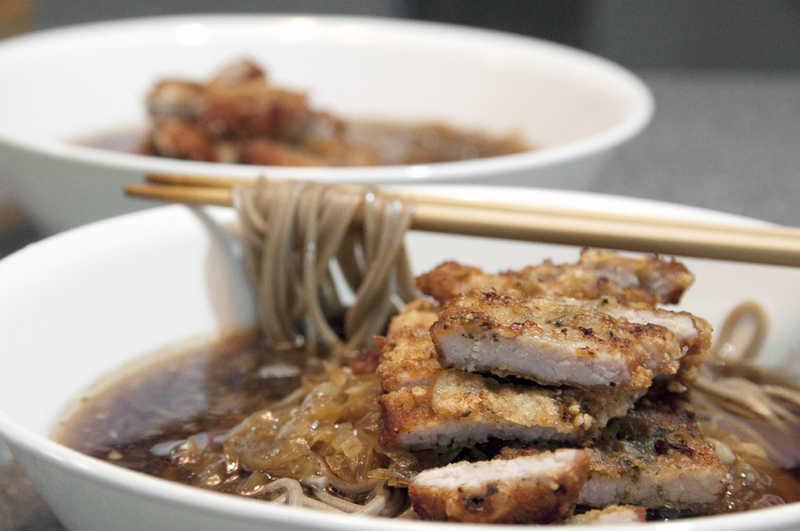 An Asian dish inspired by leftover sauce sitting around in my fridge and frozen pork loin in my freezer. Pretty quick to throw together for a nice meal. Especially on a rainy day! Cook the soba noodles in a pot of boiling water. It should not take longer than 10 minutes, depending on the noodles. Check every few minutes to make sure its not over cooked. Drain, cool with running water or bowl of cold water. Set aside. For the soup base, finely dice 1 yellow onion and finely chop 3 cloves of garlic. Pour enough oil into a heavy base pot to cover the base and start to brown the onions. Add 2 cups of the sukiyaki sauce, 1/3 cup of soba sauce and 3 cups of water. Add a few pinches of black pepper. Bring mixture to boil, taste and adjust accordingly. Pork loin is a healthy cut since there is no fat. Season the pork with salt and pepper. If you want, add any other dried herbs or powdered seasoning you have lying around. Pork goes well with almost any seasoning. With the seasoning on the pork, use a ‘meat hammer’ to tenderize the pork. Coat the loin generously with corn flour, shake off the excess and set aside. Heat up in a heavy bottom pan over medium heat, 2-3cm depth of peanut or any vegetable oil. When the oil starts to smoke, gently slide the pork into the oil, 1 piece at a time. Cook for 2-3 minutes on each side, or until medium brown. Remove and set aside on a drying rack to cool before slicing. This entry was posted in MEATS (Butcher's Delights ), NOODLES & PASTA and tagged crispy, crunchy, pork, recipe, soba, soup by Whisky Uncle. Bookmark the permalink.